The bold new 2018 Ford Explorer has arrived in Houston at Tomball Ford. If you haven’t looked at an Explorer model in awhile, you might be surprised at some of the great changes. The Explorer is a full size SUV with excellent capability. It can seat up to seven adults comfortably and even includes rear auxiliary climate control to keep them all comfortable. It comes standard with a 3.5L Ti-VCT V6 engine, or you can add the available 2.3L or 3.5L EcoBoost engine which improves the vehicle’s horsepower and torque. The explorer clocks in with an EPA-estimated 17 MPG city and 24 MPG highway. 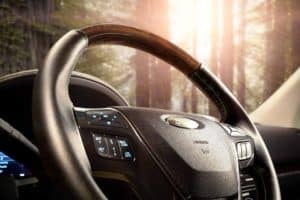 The 2018 Ford Explorer has an adventurous yet refined design aesthetic. Starting with the front, the grille has had a redesign for the year 2018. It features a dark grey background with chrome bars. The vehicle has a dynamic body shape, and it finishes in the back with bright LED taillamps. Choose from up to ten fantastic colors, depending on the trim. Some of our favorites are the Burgundy Velvet and the Magnetic Dark Grey. 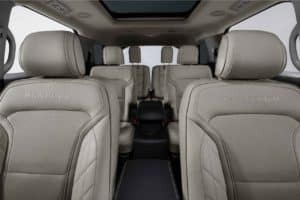 Looking inside the Explorer, your passengers will enjoy the standard privacy glass on the second and third row seating. 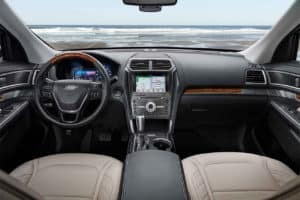 The interior of the 2018 Explorer is inviting, roomy, and more sophisticated than you might expect. Available leather seating upgrades and interior color schemes take the 2018 Explorer to the next level. The 2018 Explorer standard model starts with a base price of $31,990. It has some of the great features we mentioned above as well as large 18 inch five-spoke wheels. The XLT trim has available push button start, polished LED signature lighting, and a system to detect possible obstructions when in reverse. 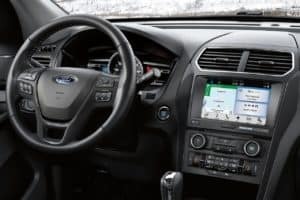 The 2018 Explorer Limited model has an available heated steering wheel, and convenient third row split folding seats to store as much cargo as a family needs. The Sport package is sure to please everyone, especially lovers of outdoor adventure and those who need to tackle various terrains. It has the 3.5L EcoBoost engine, a four-wheel-drive system that adapts to current weather and road conditions, and a stylish rear quad chrome exhaust. The Platinum trim is the ultimate Explorer model. It includes the 3.5L EcoBoost engine, an outstanding soundsystem by Sony, and a gorgeous twin panel moonroof. We think the moonroof is especially nice for long trips. The Platinum’s liftgate is also hands-free. 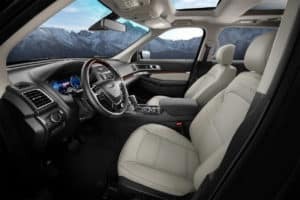 Tomball Ford has the new 2018 Ford Explorer for sale now. Stop by our convenient location today, to take the Explorer out for a spin. 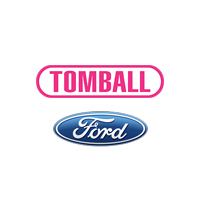 Tomball Ford is the leading Ford dealer for Conroe, The Woodlands, and Cypress. 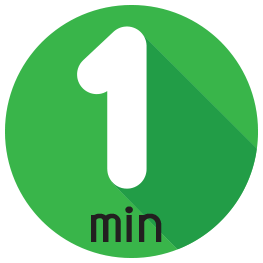 In addition to our new vehicles, we also have an impressive inventory of used and Certified Pre-Owned cars. Tomball Ford’s friendly associates are proud to help our clients find the Ford that fits their lifestyle, budget, and needs.